What a great opportunity to see the best women golfers play a great course last week. Go see a LPGA event if you have the chance! You can get right up close to the players and they are all willing to spend time with fans after the round. My favourite was the driving range where we watched Dave Stockton give Suzann Pettersen a lesson on chipping around the greens from thick lies! 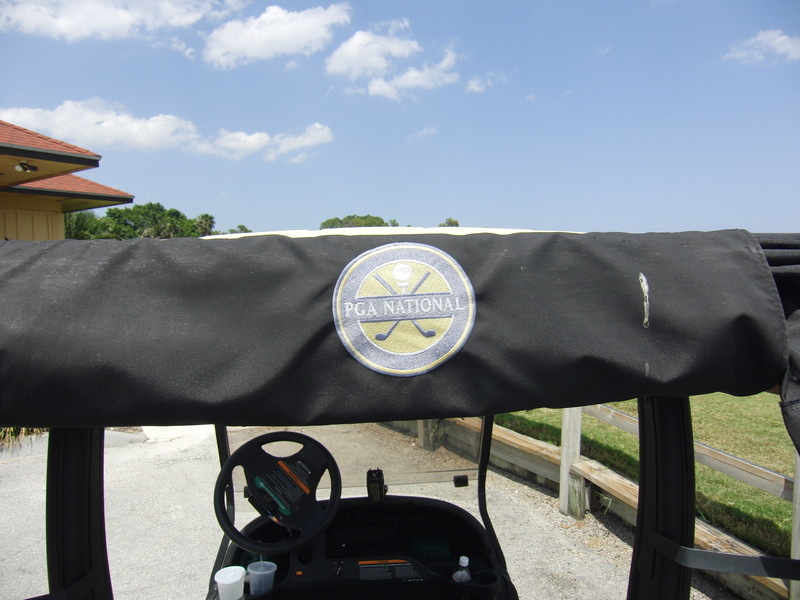 Last year I spent 4+ hours practicing at the PGA National in Palm Beach Gardens Florida. The course was slowing down for the summer season as all the “snow birds” were heading North. Beautiful course … but I wish I could have gone out to play the infamous BEAR TRAP. Would my game keep me safe and dry or would I end up in the water pounding my fist at the golf gods (AKA Jack!) Some day perhaps I will go back…but for now I will watch the Pros give it a go…maybe it will be turned into a Bear Cub all gentle by the end of the weekend. The Northern Trust Open at the beautiful Riviera CC in Pacific Palisades! This is one of my most favourite times of the year for the PGA Tour. This course is amazing – starting from the elevated Tee box #1 that is located right in front of the pro shop to the Bunker in the middle of the green on the par 3. Great test of mental skills – do you go for the green on the drivable par 4 #10 or do you lay up? Great holes – Great players! Here is a picture of Me and Sergio when I was there a few years ago watching a practice round. This weeks PGA Tour event is the Pebble Beach Pro-Am. I was fortunate to play both Pebble Beach and Spyglass in 2008. Both courses have their own challenges: for me Pebble was difficult due to strong winds and light rain the day we played. On #7 it was only a little chip 54 degree wedge to the middle of the green. Looks like the pros have a nice weather day today! Spyglass weaved its way through the local trees, up and down, and around the dog-legs. I could lay across the middle of the 4th green and touch both edges of the fringe with my toes and finger tips! What makes these courses difficult are the small greens – you have to be precise and have the sun on your side. Lo oking forward to enjoying the final round at Pebble…is Tiger on his way back? Do you Need Advice on Strength and Fitness? Recently I have been going to visit trainers and gyms in Calgary that offer golf fitness programs. For me the visits have been very educational and inspiring! As with the golf swing there are many techniques and theories on how to hit the ball. In fitness, there are many ways to improve strength, agility, power, and flexibility. Which is right for you? What are your goals? Do you know what your body limitations and strengths are? This is where I would start – have a thorough Physical Assessment to identify the areas in yourgolfbody that needs to be addressed and get educated on the best strategy to improve that limitation. Sometimes exercise alone will not improve dysfunction – look to a medical professional to help correct these imbalances: physiotherapist, massage therapist, chiropractor…etc. BUT REMEMBER – what you have corrected through passive strategies (the hands of others) you need to support actively (exercises). What can YourGolfBody do? Challenge is an 18 week challenge that runs from Jan 01 2012 to May 05 2012. Goal: Increase your activity level and improve your fitness level before golf season starts up here in Calgary (ie snow melts and courses start to open). 1 WorkOut = 30 + minutes of cardiovascular exercise (increase that heart rate) or Resistance Exercise Session, Yoga Class, Video Exs Routine etc. Over 5 WorkOuts = Eagle (-2) and Good Work Congrats to YOU!! Merry Christmas to all Golfers! May Santa Be good to your this winter! January Golf Trip Planned? Will you be ready? Here in Calgary Alberta – the ground is frost covered and the greens are starting to freeze from the cool prairie nights. Greens keepers hurry to put the course to “bed” for the winter – and protect it from the icy snow that is just around the corner. Golf season outside has come to an end. 1. Find out your golf body strength and weaknesses! It could be stability, strength,power, or mobility. Get yourself assessed and build on the findings. 2 Golf Domes are open all year round – busy in the winter, but still a great way to keep your swing grooved. Not grooved? Speak to a CPGA teaching pro at one of these facilities to get your swing working for you. 3. Don’t forget the heated outdoor ranges like GOLF CANADA CENTER! Watch your ball fly past where it would in the dome…still can be chilly out! Bring your warm clothes. 4. Work on your fitness! The time you spent on the course can now be spent doing an effective and efficient workout program. Ask a trainer where to start if you are not certain. 5. Putting: there are many short carpet places to practice your putting. You can even do this at home! 6. Read up on the mental aspect of the game – Rotella has many books that key into peak performance. Vision 54 by Marriott and Nilsson – Play your best golf now! 7. Book your trip to a sunny green destination – this carrot dangling infront of you will keep you motivated!